HABA 1157 - With the four levels of the cascade - a particularly smart obstacle - the race of the balls becomes more exciting! 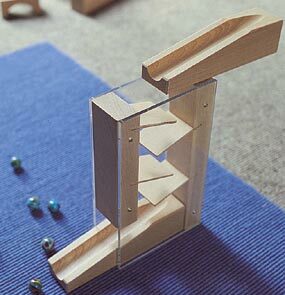 This set contains 1 cascade made from wood and plastic, 2 wooden tracks and 6 marbles. Cascade measures 5" x 8" x 2". Made from solid hardwood. Compatible with all Haba building block sets (T.C. Timber not included).